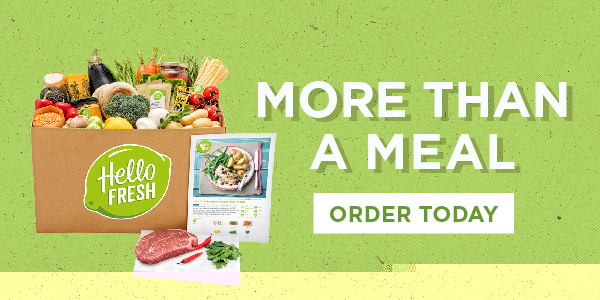 As promised, here is one of our biggest and exciting giveaways of 2018! It’s also the 8th giveaway to celebrate the blog turn 10. How would you love to win a family pass to Oz Comic-Con? 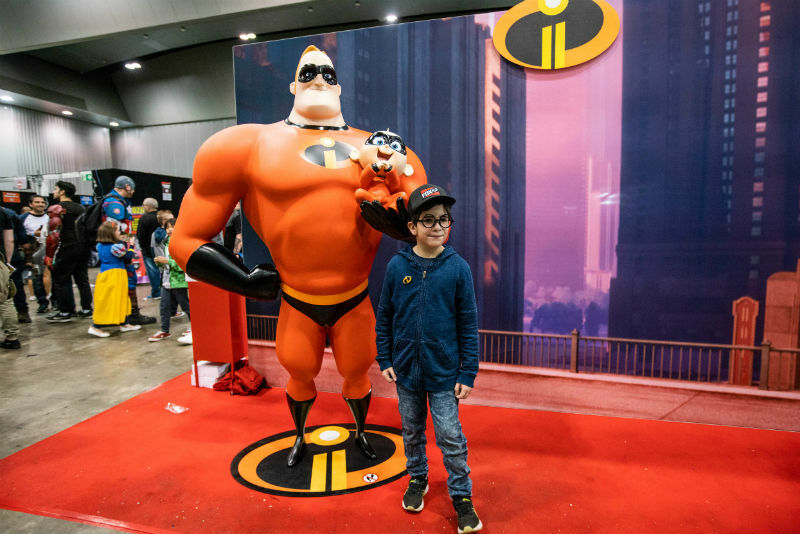 2 readers can win a family pass to Brisbane Oz Comic-Con and another reader can win family tickets to the Sydney Oz Comic-Con. When is Oz Comic-Con on? WHEN: Sept 22nd (Saturday) – 23rd (Sunday) from 9am – 6pm, daily. WHERE: The Brisbane Convention & Exhibition Centre, Merivale St & Glenelg Street, South Brisbane QLD 4101. Mr Incredible, Jack Jack, and a huge fan. WHEN: Sept 29th (Saturday) – 30th (Sunday) from 9am – 6pm, daily. WHERE: The International Convention Centre, 14 Darling Dr, Sydney NSW 2000. TICKET INFO: Early Bird tickets are now on sale – save up to 35% with General Admission Single Day Passes. Brisbane General Admission tickets will be $42.50 at the door, Sydney will be $45.00. 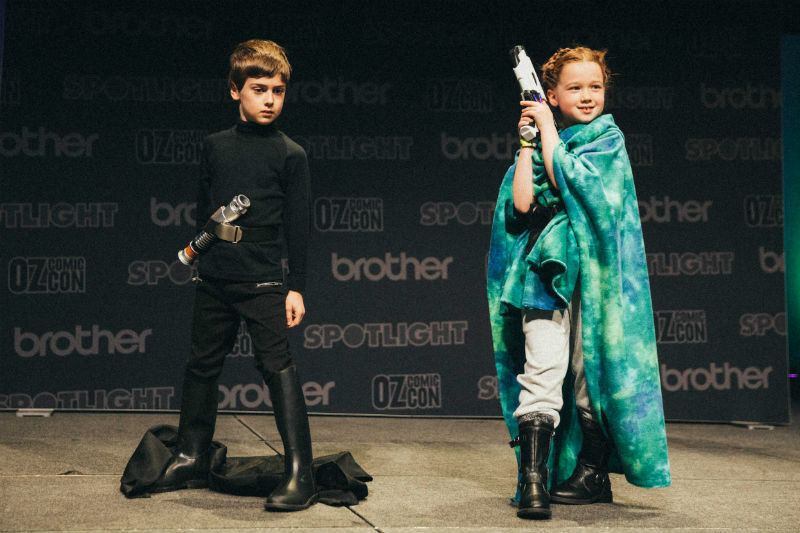 What Can You do at Oz Comic-Con? Oz Comic-Con is an exciting culmination of multi-genre content, from across the spectrum, with a lot of everything, for everyone – appearances by film and television stars, comic book artists and voice actors; gaming demonstrations and cosplay competitions; creative workshops and master classes; and hard-to-find, exclusive merchandise from vendors that’ll leave convention goers totally geeking out. I’ve always seen the overseas Comic-Con and wondered what it would be like to meet the stars of your favourite Syfi film or Marvel adventure. Maybe we will be lucky and bump into some huge film star. You never know right? Kids can try their hand at comic art, at the kids’ comic artists workshops, or even get into cosplay for the Kids Cosplay Parade. My kids would love to try their hand at some comic art and to learn more from the workshops. Comic collectors can head over to the comic grading area, and to the main stage for guest panel discussions. Anime fans will have their knowledge tested with trivia, and die-hard cosplayers can kick off their journey to take home the international title, in each city’s Championship of Cosplay heat. Remember to tell me whether you wish to go to the Brisbane event or the Sydney one. To comment to answer the above go to the bottom of the post where it says, WHAT DO YOU THINK? Then enter your comment on this post. A BIG Thank You to Oz Comic-Con for these wonderful family passes for my readers. The family and I are really excited about attending the Sydney event and if you are there and see us please say hello. Heard great things about what’s planned for the Sydney one. My eldest would love to meet Christy Romano from Kim Possible and he’s drawn dozens of comics that he’d love to show to all the creators. I’d love to go to the Brisbane Comic Con with my family. It’s always so fun to meet the different celebrities and join in the fun atmosphere of comic con. My daughters are mad keen on attending this years SYDNEY comic con. They’ve already decided on their costumes and can’t wait to interact and see all the various shows, stalls and may be a famous face or two! Our family would love to attend the Sydney event as it brings out the geek in all of us, especially the husband. It’s an excuse to dress up. We would love to attend Brisbane! We are a family of nerds, we love it all, from Star Wars to The Incredibles! We love seeing our favourite characters, actors and authors in one place – our fingers are crossed! We are huge fans of popular culture and feel right at home when surrounded by others who share our passion for comics and tv. 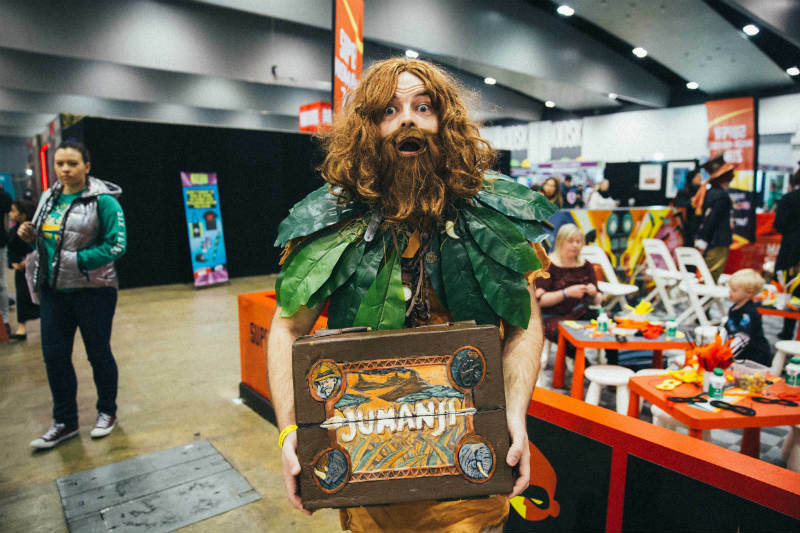 We had an absolute ball cosplaying for our first visit to Oz Comic Con Sydney last year and would love the opportunity to recreate the fun we had. The highlight of our trip was taking photos with the celebrity guests and we can’t wait to meet more of our favourite stars! I would love to attend it with my son who is a fan of Oz Comic -Con. In Sydney, please. Forgot to say Sydney please! I went last year and it was a fabulous experience! Definitely want to go this year and yes more effort to a costume for this year! Mum and Dad and little daughter. We would love to go to the Brisbane Comic-con. 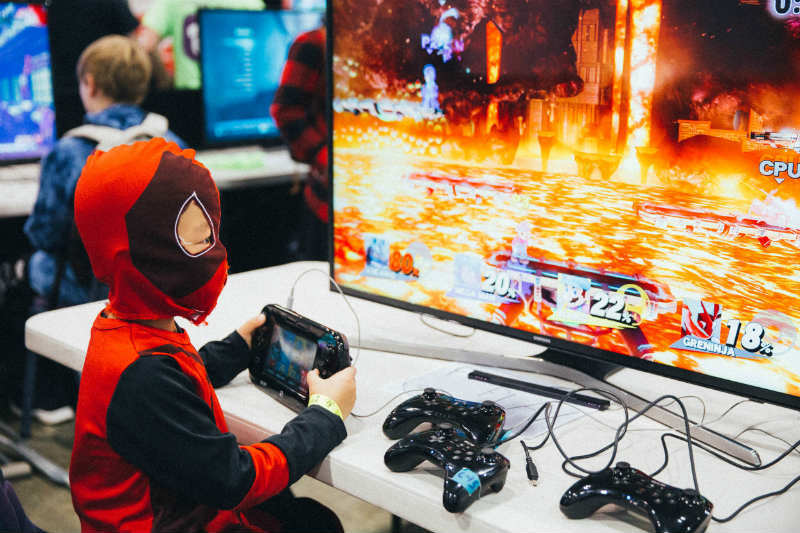 My son especially would ‘level up’ at seeing all the games and characters! A great prize! We are all geeks here, loud and proud! Passed down from our fathers to us and now down to our kids! Sydney show please. Love of comics started in 1965, and serious SciFi on TV in 1966. Granddads read comics too! And teach the love to kids and grandkids. I would love to go to the Sydney one with my three little boys, it would just blow there little minds. My boys would be enthralled by the cosplay and imaginative displays at the Sydney Comicon! They jump at any opportunity to dress up, so Comicon would be the most amazing day out for them. Would love to go to Brisbane with my nephews – they haven’t stopped talking about last years. Sydney would be so much fun 🙂 Sounds like so much to see and do, something for everyone!